I share the comments and videos below from people who have had readings by phone or in person. a sense of what a reading is like. over the years I have learned to trust Spirit to bring to each person what they need at that time. Rev. Barry King is just amazing. If you need closure and peace of mind this man can provide it. "My session with Rev. Barry King was a life changing experience for me. I have never experienced anything like this and would strongly suggest him to others." I found the whole experience utterly amazing and incredibly helpful. He is amazing! Very kind man. I would recommend him to anyone who needs guidance and feeling lost. I can also attest to his gentleness, compassion and accuracy. I will be posting a testimonial soon...until then, BELIEVE! "I've been to Rev. Barry King a few times now and I enjoy the instant feeling of peace I get when I sit down. Rev. King never ceases to amaze me when it comes to him focusing in on what's going on in my life. Before he actually starts the session, he holds your hands. From that he feels in his own body, what body parts are giving you problems/pains. It's just another wow moment - how does he do that? He has always been 100% right on that. At the end of my session, I feel stronger and more confident and I have a better understanding on how to move forward with my life. In one of my sessions, I asked if he would see if any of my deceased relatives would/could come through. My mother came through with flying colors. Rev. King had me laughing because I honestly felt like she was there. It brought me so much joy and comfort. I still smile thinking about it. In my opinion, Rev. King heals your soul, body and mind. Luckily for me I have only needed to see him a few times but I would never hesitate to go back should I need him again. Honestly, I wouldn't go to anyone else - why would you when you get what you need from Rev. King." This man , this experience has totally changed my life. I have peace of mind the society we live in couldn't or wouldn't give me. He immediately relieved the pain within literally seconds of holding my hand! He is a true force of nature , an instrument of the Creator's hand. God bless you Sir. I intend to continue with Rev. King and wish I had made him my first stop during this suffering that he has helped IMMENSELY with. I trust him with my life. I recommend him to anyone who needs help with spirit, mind and body. I was feeling lost, hurt and broken for the last year and was unsure how to pick myself back up. My visit with Rev. Barry King helped me to finally move on. It helped me see things in a different light and realize things that I could not see before. Since my visit, I've felt as though the fogginess in my head has been lifted and I have been able to find myself again, find my happiness. This was truly a great experience for me, and I highly recommend it for others who feel like they've lost themselves and need guidance. I have known Barry King for over 20 years and have seen him off and on over that time, for a variety of reasons but, mostly to help me over life’s ups and downs! Every time I see Barry I without a doubt walk out feeling clarity and much happier than when I walked in! He has a wonderful way of showing me clarity in my own life, encouraging me to do what I need to do either get beyond an issue or to do what I need to for my future. He is very gifted with spirit but, also a counselor – what more could you want! He has also brought some physical health issues to light and gave me the right direction to help/cure issues! I encourage everyone and anyone to make an appointment with Barry King – you’ll loose nothing and gain a lot of insight, helpful advice and clarity! My first time meeting Barry was at a time in my life when I felt very lost both spiritually and mentally. He offered a type of guidance that truly helped me take an honest inventory of my life. I've been to both counselors and healers on different occasions. 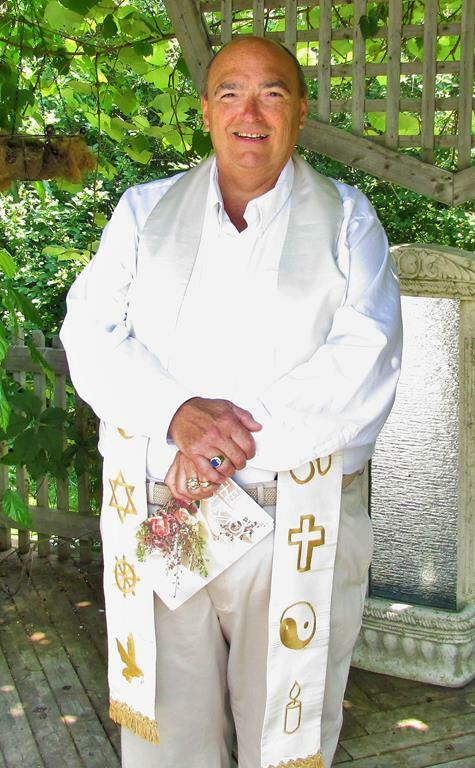 However, Rev Barry's ability to utilize his many skill sets in a very unique way that allows people to connect with themselves on a much deeper level. He takes into account that each person is at different stages in life, physically- emotionally and spiritually and is able to adapt to their individual needs. I had a reading and was astounded! He knew things that no one would know, about my life in general, past and present. He also gave me such wonderful validation regarding my loved ones who have passed on. I will be recommending him to family and friends. This was a beautiful and peaceful experience. The following testimonials were shared voluntarily by clients after their session with Rev Barry in Halifax, NS in 2016. I was a believer before I went but have never had the chance to experience it. It was relaxing, comfortable, and very peaceful. He was dead on about things in my life but when he said he sees a boy, I lost it. In a good way. I lost a friend at a very young she, he was killed by a drunk driver. I have visited his grave every year. He first asked if I had a miscarriage as it was a young boy. He said he is tall though and dark hair! It was Pat. Highly recommend Rev King to everyone. You will not be disappointed and I can't wait to go again. `My Mother had passed away recently and I went to see Rev King based on a FaceBook ad that popped up. It wasn't my intention to search him out but there his ad was, and it piqued my curiosity! So I tentatively made the appointment and I went in to the session very skeptical and unsure. Rev King eased my anxiety in the first few minutes with things he said and knew about me. He knew how my Mom was feeling in the days before she passed away and he said some very comforting things about her. I believe there was no way he could have known my Mom's personality and how she had passed away and how I was feeling so sad about her death and missing her. But he was right on! My Mother had a good long life at age 94. I totally recommend Rev King to help you bring closure and peace with a loved ones passing. I was referred to Reverend Barry King by my sister. My phone reading was very enlightening in the sense that it helped me understand that our loved ones never truly leave. Things that he said without knowing who I was was amazing. His connection with my daughter was like she was truly here. Other things that came through of my son who is still on this plane healthy and happy received through my daughter caused me to step back and chuckle as those things happened after her passing. Rev. Barry had no way of knowing that as I did not divulge that. Also knowing that my son who I lost in early pregnancy is also well and loved beyond the veil gave me a sense of finally knowing him. It helped me with my feelings of guilt of not being able to save her. I understand it now.... that we are all here for short time and her message rang clearly that I will reunite with her when my time has come. I am moving forwards each day with one foot in front of the other and seeing joy that she wants for me and not to forget her. I will definitely do another reading as I'm excited to see how far I've come. I have also referred Rev. Barry to others and I encourage them to seek that understanding and peace for themselves. Thank you so much. Testimonials from people who have had readings with Rev Barry King, Master Spiritual Medium in Charlottetown, Prince Edward Island in 2017. The following video testimonial was shared voluntarily by clients after a session with Rev Barry in 2016. This was my second session with Rev King and I was a little nervous wondering if he would just see the same things as the last time or if new things would come to light. I was very happy with my session. Once again he zeroed in on some health issues I had and reassured me that everything would turn out alright. That in itself put my mind at ease. He talked about totally different subjects than the last time and as usual was right on the money with what is happening. He tells you what is going on in such a positive way, it is a pleasure just to talk with him. It was a great session and hated to see it end. He is a very nice person and makes you feel so comfortable and relaxed and not rushed. I look forward to another session in the future and can recommend it to anyone I am sure you won’t be disappointed. I went to see Rev Barry King for a reading in the hopes of connecting with my Mom who passed away only a few months ago. Rev Barry connected with my Mom and my Dad (who passed away suddenly 5 years ago) immediately. It was such a relief to me to be able to communicate with my parents through Rev Barry. I was able to have questions answered that had been on my mind and my heart since they passed ️ I would highly recommend Rev Barry King to anyone who feels the need to contact a loved one who has passed.....it made all the difference for me in easing my concerns and the heaviness that I had on my heart. Thank you Rev Barry. I am very thankful to have had this session with Barry King. He right away made me feel very comfortable. I was amazed sometimes at the accuracy of his messages to me. He was spot on at the changes happening in our lives as we just purchased a new home. I have deep concerns for a family member and he was able to provide great perspective on the situation, where it's at and what could and should happen, for this I was very grateful and it made me feel more at peace. I was also thankful that I was able to record the session on my smart phone and have listened to it since, it somehow brings new meaning. ​I would not hesitate to recommend Mr. King and I will definitely look him up again in the future. Well I am going to start by saying I have been following Rev. Barry Kings website for quite some time, and reading through testimonials. Then after having lost a family member, I felt very lost, sad, confused, a hurt I had never felt before. So not really knowing what I was looking for, or hoping for, i found myself thinking more and more about this website I had read about and started feeling the urge inside to have to see him. A feeling that would not go away, so I made the call and went to see Rev. Barry King. A day I will never regret. He is so calming to listen to. And he had answers for me for questions I didn't even have to ask about. Facts of exactly what I had just gone through in detail with the passing of my sister. I walked out of that session with such a weight lifted off my shoulders and peace inside me. I will definitely be seeing him in the future again. I often listen to his meditation sessions before going to sleep. He brings you to a peaceful place within. He is one very gifted soul. Thank you so much. God bless you Rev.Barry King. I would highly recommend Rev Barry King to anyone who feels the need to contact a loved one who has passed.....it made all the difference for me in easing my concerns and the heaviness that I had on my heart. ​My phone reading with Rev Barry was very accurate. I keep thinking he must have been living in my walls. Not only is he accurate, he listens and does not rush the conversation. It was very validating for me to hear what he had to say since I “kind of” knew it but now I KNOW it. He was pleasant and professional. I will definitely be calling him again. I booked a session with the Rev. Barry King because I was at a crossroad in life and was unsure of which direction to go. I found our meeting to be extremely informative and very accurate. His comments and suggestions have re-shaped my direction and have helped me create a new focus, which has had a profound impact on my personal journey in a very positive way. I would like to thank Rev. King for his guidance and look forward to our next encounter. My reading was the best thing that has happened to me ,in a very long time. I should have done it sooner. When I opened the door I was in a lovely room hearing a waterfall, seeing the beautiful stain glass, the soft glow of lighted candles, Everything was soothing and calming. Everything felt so natural to me. Rev. Barry King is 'Real', not all that stuff you see on TV or at the local circus. Rev. Barry King was right on about the things in my life that are bothering me the most and he even hit on a few things that I had forgotten about.His reading so powerful for me, and he did it in a loving and calming way. Nothing to be scared about. Rev. Barry King is an amazing man and his gift of 'Spirits' and how he relates to you what they say is truly a beautiful gift that he shares with others. I will be attending my first 'Message Circle' in the next few weeks, and I know that it will be a "New' wonderful experience for me. Thank you Rev. Barry King for giving me back 'hope' and feeling 'loved' again. I wanted to share a little about the personal reading I had with Rev. Barry. There are so many misconceptions regarding this practice but let me tell you there is absolutely nothing to be skeptical of, nothing to be afraid of. Barry has the ability to help you figure out if you're going down the right path in life, he can give you answers to questions that may have been holding you back from moving forward, the list goes on but honestly, I'd have to write a book! I went to Barry in hopes of finding out things about my life that have been extremely hard, including my health. I promise you that I left feeling lighter and focused, more than I've ever been in my life. I look forward to continue working with Barry. He will forever be a source of healing, comfort and a teacher. I'm truly honoured and thankful that Barry was brought to my life. ​I had been thinking for quit some time that I wanted to have a reading with Barry, a loved one had gone to see him previously and allowed me to listen to the reading Barry gave him. I was honestly blown away. I saw him and I can say it gave me more direction in my life, I was feeling stuck. Barry helped me see what I knew in my heart. He also pointed out my health issues, which are minor but Barry could feel what they are! He knew things about me that not even my closest friend knew, my struggles with myself! I would highly recommend a reading from Barry. He allowed me to record the session so I can listen to it anytime. The following video testimonial was shared voluntarily by a client after her session with Rev Barry in Saint John, NB. Thank you so much for the wonderful experience. I was very skeptical before my readying but this was the real deal! The reading has helped bring clarity to my life and will help me for the future. I highly recommend getting a reading done from Rev. Barry King, he will not disappoint! I have visited Reverend Barry King 3 times now. Twice at his residence/Church and once at an open reading for the general public. I can honestly say there is something about this man that makes him very aware of you and your situation in everyday life, health, family, and spiritually. I thought it was a lot of him researching you as he checks you out you on Facebook and social media to get a read on you. Within 1 minute he could tell I was suffering from severe chronic pain not only that where it was located and how it felt. He knew things about me I never told anyone, posted anywhere or left written somewhere. Not only could he tell me about my physical pain . Rev. King could tell I was suffering from an emotional and mental place and tell me how I was suffering and why. I went in a skeptic walked out a true believer. His voice, his demeanor his overall conduct puts you really in state of peace and relaxation the hour you spend with him just flies by and when you are done you will walk out with a better understanding of yourself. I can tell you with myself I had a state of calm and understanding along with a direction on maybe I should follow. I highly recommend Rev. Barry King after you are done being amazed on his ability you will even more amazed on how you feel when you leave. I am going back as well as my wife. ​The following video testimonial was shared voluntarily by the client after a session with Rev Barry in Saint John , N.B. ​Halifax, NS and Saint John, NB. I went to see Rev. Barry King not sure exactly what to expect, or knowing exactly what it was I wanted out of the session. During my session I was quite surprised with how well he could read me as a person, as well as my friends and family around me. Only after my appointment did I start to put together some of the things he was saying, and making sense of them. I was not fully understanding them during the session, and now it is so clear and the information was so accurate. I really received a piece of mind from this reading, and realized to focus on the positive around me. I realized I can't change everyone, but I can change my perspective and accept what is. It was quite the enjoyable and enlightening experience for me. Thank you Rev. Barry King for such a wonderful session. I just want to say I was very pleased with my reading. I wanted so badly to hear from one spirit and this spirit did come through very strong. I now feel so free... to let my feelings be at peace with this. My husband came along with me as support but he was totally amazed at what all came out. It was my reading but it made a believer out of him.... that spirits can send messages back to us. There was something that was being picked up about one of my brothers and when I came home I spoke to him and he can receive messages from spirits also but does not feel comfortable about letting it out. Rev King has great ability to receive messages from spirits. I thank you again for my reading and also for the peace I received from it. My experience with u was unbelievable!! The connection u made with me was amazing and unreal! At first I was so nervous but so excited at the same time! I wanted so much to believe that our loved ones are trying to reach out to us and when my dad showed up in our session I lost it!!! Lol I had so many questions but I just blanked out and u helped me through out our session! The way u described him and knew how he passed on was unbelievable!! I do recommend u to everyone I talked to and really want to go see u again !!! I was a little bit unsettled that my daughter's presence wasn't as strong as my dad's but hopefully next time she and I can reach out to each other!! The one big question I had .... u helped me come to terms over my guilt! I thank you so much !!!!!!! ​Join Elaine St Louis as she discusses her wonderful experience with Rev. Barry King in what she learned and found incredibly helpful. I have visited Rev. Barry many times over the past decade. After each visit, I have gained a renewed sense of well-being and am reminded to have faith in the universe and in my own life path. Connecting with spirit through Rev. King is like reconnecting with self. It strips you of your ego and allows a glimpse of your true nature. I have listened to my recorded sessions on occasion and find that as time passes they continue to resonate and hold even greater meaning. I highly recommend this experience for anyone." Now that my children are getting older and becoming self sufficient, I decided in early 2016 that it was time to make myself a priority and began a spiritual journey of self discovery to heal wounds of my past. I have been making a lot of positive changes in my life but felt there was still some unanswered questions/life choices that I was struggling with and felt was hindering my progress. Then one day, Rev. King's Facebook page showed up in my news feed and I felt it was a sign. I tried not to have any expectations but did think about two very specific topics that I hoped Rev. King would connect with and was over the moon when he picked up on both. One was about my mom. Rev. King talked about her so vividly, that it brought me the answers I needed to heal the feelings of abandonment we so often experience when we lose a parent at such a young age. The other was regarding a career opportunity, he confirmed that I made the right choice and talked about aspects of my job that validated I am making a difference. This man is such a bright light and although he was a complete stranger, he felt like "home". I have not encountered many people in my life that brought you that instantaneous sense of peace and comfort. This gentle and kind man is very wise and really connects with you when you have a reading with him. He is able to put your questions into words and give you advise to come to the answer that is right for you. I was kind of sad when my reading was over, because I wanted to hear so much more from him. It was very pleasant from beginning to end and indeed felt like you were just having a conversation over tea. Thank you so much Rev. for your advice and guidance! I still use it every day and do want to make another appointment in the near future, to see if you have any more advice/guidance. My visit with Dr. Barry King was an eye opener. I admit, I was a bit skeptical before I went to see him, as I didn’t really know what to expect. He made me feel at ease and he explained how the session would unfold. It was amazing the way he told me things that only “my Spirit” would know. Hearing him say the same things I have been saying to myself for a few years brought much needed awareness within myself. I highly recommend his services. It was an amazing experience for me. I had the pleasure of meeting Rev. Barry King for a reading recently. It was a difficult time in my life and his kind, sincere and warm manner was very calming. He was spot on with what was happening and had excellent advice for me going forward. It was truly amazing and I will be forever grateful. I look forward to visiting with him again someday and would recommend him to anyone seeking answers and some direction in their life. I was very nervous and somewhat apprehensive, while I was waiting for my appointment on that day. From the moment I met Rev Barry King, I was put at complete ease and felt very comfortable. He knew exactly how I was feeling, and the struggles I was dealing with, which just blew me away. He was able to identify very quickly some minor health issues I was having, which again totally amazed me. He has such a very calming personality and compassion for his clients. I would highly recommend Rev Barry King to anyone needing peace and tranquility in their lives." I wanted to share my story with you about my visit with Dr.Barry King. I had a recent loss in my life, 8 weeks earlier, and I felt stuck. I can't say my faith was in question but I can say that the belief that my parents were together and happy was peppered with doubt. I have always wanted to believe that there is a great afterlife; Barry confirmed that for me, and what he said made me smile. The best thing about Barry is that he doesn't tell you WHAT to do, he gives you information and lets you make the choice. Somehow, he knew about my personal relationship and he told me what I knew in my heart. It was amazing to hear from a person, that I had only just met, that something that had been on-going for years needed to be dealt with, and disposed of, so I could move on and find happiness. I had begun a huge undertaking to change the future of my life, Barry told me I was going to do great with my decision and he wished me nothing but success and happiness. I know I wasn't 100% confident that my decision to change my life direction was going to work, but after my session with Barry, I now know for certain and am chomping at the bit to move forward to find happiness in both my professional life and personal life. What amazed me about this session is that there was no way he knew all of that about me, because I hadn't told him any of that stuff. Thank you so much Barry. I had the privilege of meeting Rev Barry King , my experience was great , very healing and seems exactly what I needed at that moment in time . He is very compassionate and joyful he knew exactly how I was feeling it was amazing. Also connected with some family who have crossed over very blessed to have had this experience I would recommend a session with Rev Barry if you need a healing or want to connect with someone who has moved on to the next phase of life or just if you need some direction in your life . Thanks Rev Barry King for the experience you have given me , and how to heal and move forward . I have been getting good vibes from reading about Rev Barry, so I decided it was time for me to make an appointment. This man has a loving, calm energy. I felt at ease in his presence. He intuitively scanned me for physical symptoms and identified them correctly and sent healing energy through my body. My reading was mostly about a certain life situation which has been consuming me for a very long time. Although I never mentioned this at all, he saw that I was "trapped" in this and I needed to let it go, as it was making me physically and emotionally unwell. He helped me to understand that I did the best I could. He also connected with my loved ones, describing them very well and letting me know that they are still with me and are very much at peace. A very comforting message. This session was like a soft, warm hug. I was a little nervous going for my first reading, but I had read a lot of the testimonials so that had put me at ease some. I decided that if this wasn’t any different from other reading I had gone to then I would stop going to them. Boy am I glad I went! Rev Barry King is so personable you feel very welcome. I firstly learnt how to use voice recording on my phone which was great in itself since I never knew I even had that on my phone lol. Then when we started he recognized some health issues I was having and reassured me about them. The thing that I really liked is he didn’t dwell on my past which is what most readings do and while that is interesting, I already knew my past I wanted to connect with a loved one more. We got to that right away it was a great experience and things he said were so true! It was a first for me, and very comforting. I was struggling with the death of a loved one and just hearing all he said made me feel so much better and I didn’t even realize how much till a few days later, I think I accept the passing more now then I did before I went. I listen to my recording whenever I start to feel down and it brings me right back up. It was an overall great experience and I will definitely go again. I would recommend it to everyone who is open to a wonderful experience. As with any appointment of this type, I felt it necessary to limit the information I offered at the outset. I provided my first name and secured an appointment. I expected that if Dr. Barry King was genuine, and presenting himself as interdisciplinary, perhaps could self direct. I was open to anything he would offer, whether naturopathy, spiritual guidance, counsel or intuitive healing. He did not disappoint. With much physical, mental, emotional and spiritual commotion in my life at that time I left it up to him to identify and address anything he felt compelled to mention. He addressed my physical health, my mental state, my emotional state and touched on each thing in oddly specific detail. Despite all of this "noise" in my life it took him less than 15 minutes to realize that I had suffered a death in my family in recent days. He again opened this subject with oddly specific commentary. I was reassured and felt as though I had been given that "one more conversation" that I had wanted to have with this family member. Dr. Barry King used all of his skill and training to offer me a wholistic conversation where chaos found order, the storm felt calmed, Despite things not being okay in my life at present, I left feeling as though it was alright and I was on the right track. I highly recommend an appointment with this man. There is very little to lose and a great deal to be gained. Be open to what he has to offer you. I think he has something to say that you need to hear. ​I met with Rev. Barry King in early April. I saw his ad on Facebook and I liked the warmth that I sensed from him so I booked an appointment. I had a strong sense that I was being pushed by Spirit to go see Barry for a Spiritual reading. I was very much at ease and he had been kind enough to forward a short video prior to my appointment. It explained what to expect during my reading and I found this to be very helpful as I had never been to a Medium before. For me personally, I mostly needed to know that the people that had already passed on were okay and that I was moving along the right path for my soul's journey. I believe that anyone that can do what Barry does has a special gift and that it should not be exploited. Barry does not charge an exorbitant fee for sharing his gift with you. He does not rush through the session. He was spot-on when he did my healing and then proceeded to tell me about my issues with my body. If you believe in things like this, then I highly recommend that you book an appointment with Rev. Barry King. I have no doubt that you will be given the answers to what you are looking for.